UPDATE: The league has retroactively attributed Republic FC's goal to Jaime Villarreal and the associated assist to Sam Werner. SACRAMENTO, Calif. (April 6, 2019) — A late volley from Jaime Villarreal helped Sacramento Republic FC earn three points in front of a sold-out Papa Murphy’s Park crowd on Saturday night. Republic FC enjoyed most of the possession in the first half and saw their first good opportunity in the 38th minute. Tyler Blackwood cut into the box after losing his defender on the left wing and curled a shot to the far post, but Austin Bold FC keeper Diego Restrepo made a diving save to block it away. A minute later, Restrepo was forced to charge outside the 18-yard box to parry away a chance from an on-rushing Cameron Iwasa. Just before halftime, Austin’s Xavier Báez nearly snuck in the opening goal with a free kick from 30 yards out. Báez drilled his shot low and through the wall of Republic FC defenders. Josh Cohen saw the shot late but reacted quickly enough to dive to his right and get a hand on it to make a key save. Iwasa nearly opened the score in the 67th minute after lining up a shot just outside the box that crossed up Restrepo, but the veteran keeper responded well to keep the game scoreless. Republic FC finally broke the deadlock with five minutes left to play. Second-half substitute Sam Werner hooked in a corner kick that found an unmarked Jaime Villarreal who volleyed his shot on frame. Bold FC defender Jermaine Taylor tried to head the shot away, but his attempt bounced backward to beat Restrepo go into the back of the net. Sacramento withstood the late Austin rally thanks to a pair of saves from Cohen to take all three points from their first-ever encounter against Bold FC. The win moved Republic FC up to 10 points on the season and into a four-way tie for the top spot in Western Conference. Republic FC will take on one of those four teams next when they visit Portland Timbers 2 on April 13. Scoring Summary: SAC – Jaime Villarreal (Sam Werner) 85. 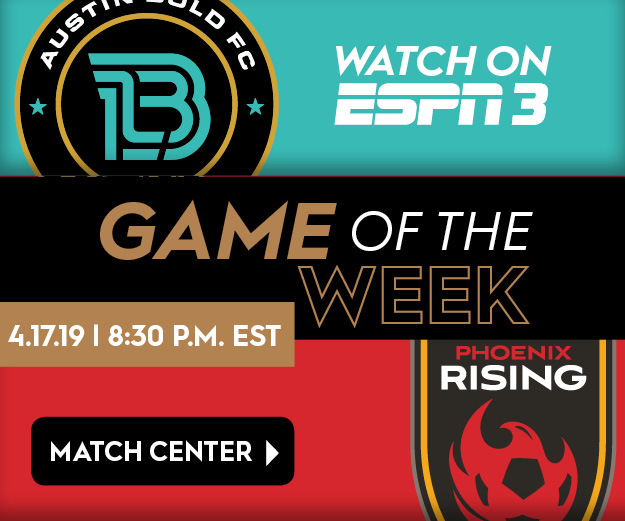 Austin Bold FC – Diego Restrepo, Jermaine Taylor©, Amobi Okugo, Thomas de Villardi, Jorge Troncoso (André Lima 51), Fabien Garcia (Calum Mallace 72), Marcelo Saragosa, Xavier Báez, Valeri Saramutin, Kléber Giacomazzi, Promise Isaac (Sonny Guadarrama 76). Subs Not Used: Juan Ramirez, Julian Gaines, Kris Tyrpak, Clayton Adams. Stats: Shots: 10, Shots on Goal: 2, Saves: 3, Fouls: 13, Corner Kicks: 4, Offside: 1. Sacramento Republic FC – Josh Cohen, Shannon Gomez, Mitchell Taintor, Dekel Keinan, Jordan McCrary (Haris Chantzopoulos 89), Jaime Villarreal, Ray Saari, Drew Skundrich (Stefano Bonomo 68), Tyler Blackwood, Villyan Bijev (Sam Werner 70), Cameron Iwasa. Stats: Shots: 5, Shots on Goal: 3, Saves: 2, Fouls: 13, Corner Kicks: 9, Offside: 1.